Photo courtesy of Fernando Salazar and The Wichita Eagle. 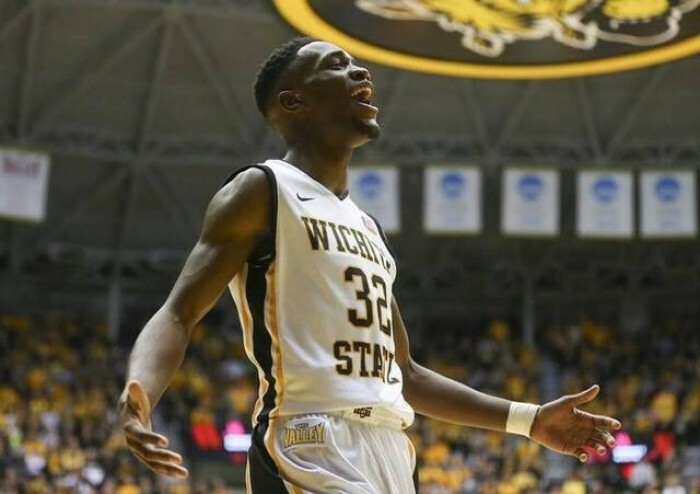 When Missouri Valley Conference play opened just before the start of 2016, the only way the Wichita State Shockers seemed NCAA Tournament bound was if they won "Arch Madness." Now, with them running the table, they seem back in the running for an at-large bid. WICHITA, KANSAS---30 points. The Wichita State Shockers were a 30-point favorite for today's conference matchup with the Bradley Braves. Therefore, if the freshmen from Peoria would win on the road in Charles Koch Arena, it would be the biggest upset in Missouri Valley Conference history. But, like all other conference opponents thus far, the Braves learned, "You don't want to go to war with the Shockers." Running out on a 10-0 run with four points coming from each Shaquille Morris and Fred VanVleet, Wichita State charged forward to a 17-3 lead less than eight minutes into the contest. Despite Luuk van Bree drilling back-to-back triples to pull the Braves within eight and create some hope for Bradley fans, the Shockers quickly reset their opponent's progress with a 5-0 mini-spurt (22-9 WICHST). While the Braves showed determination through the ability to only be down 12 at the 5:36 mark, 13 Wichita State points during the same time Bradley netted 2 turned a somewhat reasonable deficit into a blowout waiting to end (44-21 WICHST). Coming out of halftime, matters only became worse for the Braves as Gregg Marshall's squad continued their dominance with a 21-8 run. And in case you lost track at home, that meant Wichita State was leading by 36 (65-29 WICHST)! Thankfully though, this one didn't get too much uglier as the Shockers led by a game-high 37 before winning by the score of 88-54. So, Saturday was definitely not a game either of Wichita State's "star seniors" Fred VanVleet and Ron Baker will remember when looking back on their careers. Combining for 25 points and 7 rebounds on 7-of-16 shooting (which by no means is a poor performance, but is much less than what we normally expect from the duo), the two were arguably overshadowed by ten points apiece from youngsters Shaquille Morris and Markis McDuffie. Granted, Baker and VanVleet will be playing more than 24 minutes against top challengers Evansville, Southern Illinois, and Indiana State, but this journalist feels their less than impressive outings should be pointed out. 14-5 (8-0) Wichita State will look to move to 9-0 in MVC play Wednesday when they host Loyola (IL). With ten freshmen on the roster, improvement from the Bradley Braves is not going to be seen from their record. Let's face it, with today's defeat Brian Wardle's group is 3-18 overall and 1-7 in conference play, meaning there is no way seven wins is obtainable, and maybe not five! However, the fact that four starters, three freshmen, posted double-figures has to be encouraging as no one netted more than nine in the first meeting between the two. Led by fourteen points by Ronnie Suggs, Bradley also saw very good contributions from Luuk van Bree, who nearly captured a double-double (13 points and 7 rebounds), sophomore Donte Thomas (11 points, 5 rebounds, and 2 assists), and point guard Dwayne Lautier-Ogunleye (10 points and 6 rebounds). Such an offensive effort could be exactly what Bradley needs to "upset" a flounder Northern Iowa Panthers team Wednesday.